: Pack Hound for big game. : Revised by J. Mulholland (2008) in collaboration with R. Triquet. 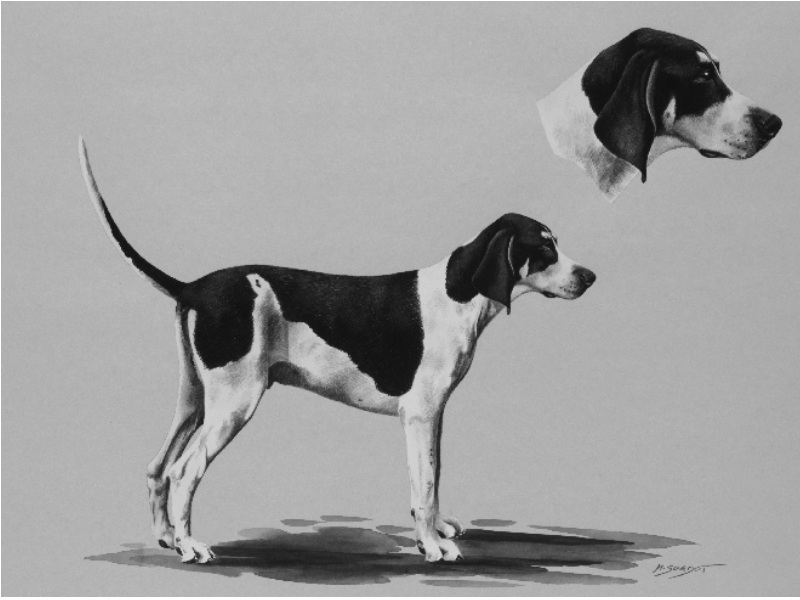 : This breed originates from the “Bâtard Anglo-Saintongeois”, a type which appeared in the middle of the XIXth century and which was the result of crossing between the Saintongeois and the Foxhound. The breed presently counts approximately 2000 subjects with around 200 births per year. It makes up the packs of twenty or more deer hunts and one stag hunt. The 2007 text was drafted by M. Pierre Astié, President of the “Club du chien d’ordre” and his committee, in collaboration with Mr. Raymond Triquet. : Big, rather powerful dog, resistant and robust with strong bone which is a reminder of his Gascon-Saintongeois origins. The length of the body, from the point of the shoulder to the point of buttock, is equal to the height at the withers. : Excels in hunting stag and deer on damp or bushy terrain. It is a friendly dog, close to humans and easy to manage in the kennels. : Strong, rather short with skull/muzzle lines parallel..
: Rather flat and broad, occipital protuberance hardly marked, superciliary arches prominent. : Black, developed and rather raised. Nostrils well open. : Straight and a little less long than the skull. : The flews are distinctly square, seen from the side; the upper lip overlaps the lower lip well. : Brown, relatively deep-set but not excessively. : Set-on rather broad and at eye level; relatively flat at set-on then curling towards the end; of medium length.. When pulled forward, they should not reach further than two fingers before the base of the nose leather. The tips are rather pointed. : Strong, rather short. A slight dewlap is tolerated. : Straight and well sustained..
: Quite broad, rather short. : Slightly sloping;hips quite broad. : Chest: Broad and well let down to the point of the elbow. : Strong at its root, tapering to a slender point, long and straight; in action, it is carried above the topline but not vertical. : In line with the body; more round than flat. : Very slightly sloping, seen from the side. : Thick and big, rather round. : Thick and big, rather round..
: Parallel, seen from behind. : Well let down, muscled but not over developed. : Only slightly bent , seen from the side. : Effortless. Preferred gait supple and extended gallop. : White under white hair, black under black hair with sometimes patches on the belly and inner thighs of blue or pale blue colour. : Short, quite strong and dense. Obligatory white and black, with a black mantle and black markings more or less spread out which may show black or bluish speckles, or even tiny tan freckles but the latter only on the limbs. A pale tan dot above each eye as well as pale tan on the cheeks, below the eyes, below the ears. The “roebuck mark” on the thigh is rather frequent. Females 62 to 68 cm. With tolerance of +/- 1cm. Nose: Important lack of pigmentation. Eyes: too light in colour. Ears: dictinctly curled, too long. Colour on the cheeks, black extending to the lips.